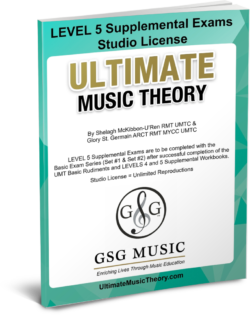 Preparing for the Level 5 Music Theory Exam is EASY when you use Ultimate Music Theory! The 2016 RCM Theory Syllabus has combined the “Theory” components of the (previous) Preparatory, Basic, Intermediate and Advanced Rudiments with the Language of Harmony and History (formerly the Level 3 History and Harmony levels). 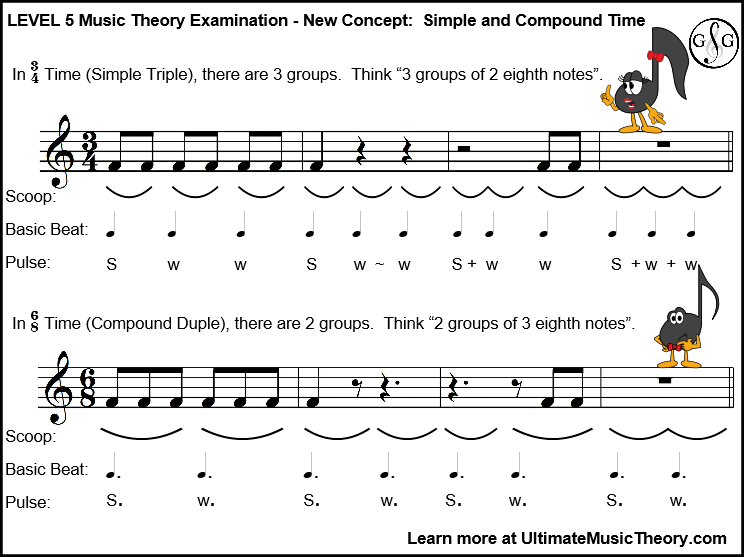 In this Blog, I will be looking at some of these “New Concepts” in the Level 5 Theory Exam (formerly the Basic Rudiments Exam) and I will provide tips on how we can simplify these concepts for our students. AND you will learn how to Prepare your Students for the Level 5 Music Theory Exams! Ti-Do Tip: Introducing Compound Time Signatures at this level can be tricky for some students. For these students, approaching it from a “TWO groups of THREE” can make it easier for students to remember the Strong-Weak-Weak Rule of Three. 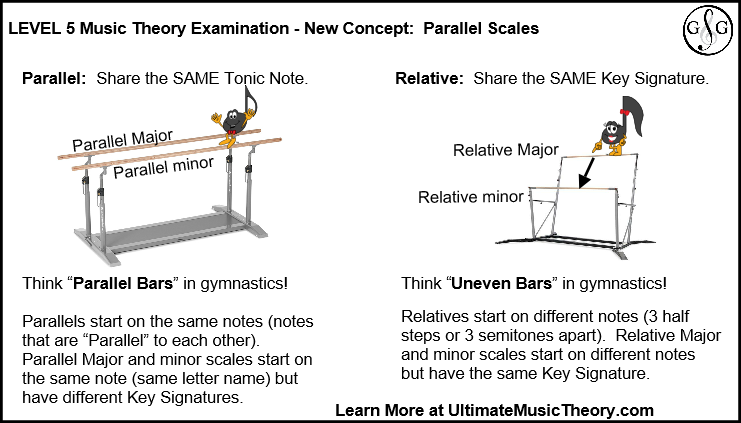 The new term of “Parallel Major and minor scales” is simply another term for “Tonic Major and minor scales”. Parallel Major and minor scales share the same Tonic note. Ti-Do Tip: In gymnastics, the “Parallel Bars” are the equipment where the bars for each hand are level (Parallel). If your right hand is on the “C Major Bar” and your left hand has to go on the “Parallel minor”, it would go on the “c minor Bar”. Both hands are on “Parallel C’s”. The opposite is the “Uneven Bars”, where one is higher and the other is lower. Consider this the “Relative Major and minor Bars”. If your right hand is up higher on the “C Major Bar”, your left hand would go 3 steps lower to the Relative minor bar – the a minor bar! In the Level 5 Music Theory Exam, students may be asked to "Write the Parallel Major" or "Write the Parallel minor". However, I have also seen this question worded as "Write the Tonic Major" or "Write the Tonic minor". Students need to know that "Parallel" and "Tonic" mean the same thing in this type of question. 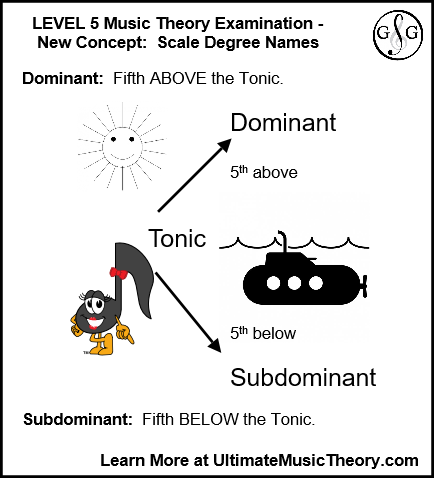 While these concepts have been a part of the UMT Workbooks, students now need to know for their exam requirements the Scale Degree Names: Tonic, Subdominant, Dominant, Leading Tone and Subtonic. Ti-Do Tip: “Tonic” provides the “tonality” of the key. It is the KEY note, the first note. “Dominant” is the next most important note. Tonality (Key Signatures) are based upon the Circle of Fifths. The Dominant is a FIFTH above the Tonic. “Subdominant” is simply the fifth BELOW the Tonic. The prefix “sub” means “below” – think SUBway (below the ground) and SUBmarine (below the surface of the water). “Leading Tone” (or “Leading Note”) leads up to the upper Tonic. Play a scale ascending on your instrument but stop at the 7th note. Don’t you just want to keep going to that Tonic note? The Leading Tone is always a half step/semitone below the Tonic. Students can identify this as “Leading Tone” or “Leading Note”. Either is acceptable. “Subtonic” is a whole step/whole tone BELOW the Tonic. (Supertonic is a whole step/whole tone ABOVE the Tonic.) This scale degree is found in the natural minor scale and the descending melodic minor scale. The 2016 RCM Theory Syllabus requires the learning of “Harmony and History Concepts” beginning in Level 1 Theory. In the old syllabus, these concepts were not introduced until “Harmony” and “History” (which came after Basic, Intermediate and Advanced Rudiments). Dominant 7th Chords in Root Position. Functional Chord Symbols (I, i, IV, iv, V, V7) in Root Position only. Root/Quality Chord Symbols (for example, C, Am, G7). Composition of a 4 measure answer (consequent) phrase to a given question (antecedent) phrase in a Major key, creating a parallel period. Stable and Unstable Scale Degrees. Identification of Question-Answer Phrase pairs (parallel period). Melodic Phrases: same, similar or different (a, a1 or b). Voices in Song. “Hallelujah Chorus” from Messiah; “Queen of the Night” from The Magic Flute; and “Over the Rainbow” from The Wizard of Oz. 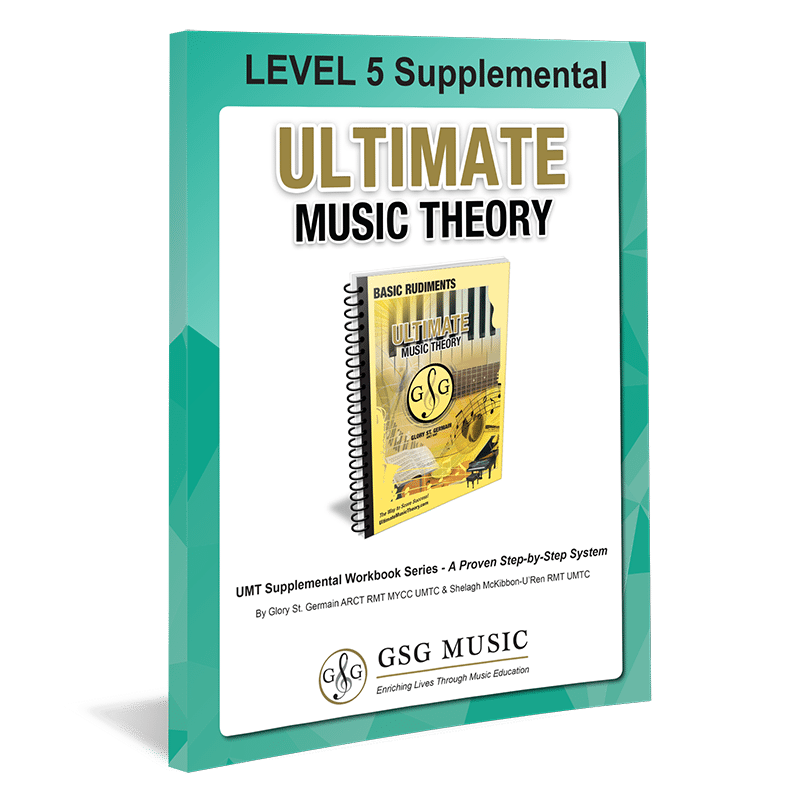 These new Harmony and History Concepts are taught in the Ultimate Music Theory Supplemental LEVEL 5 Workbook. There are simply too many new concepts to talk about in this blog! 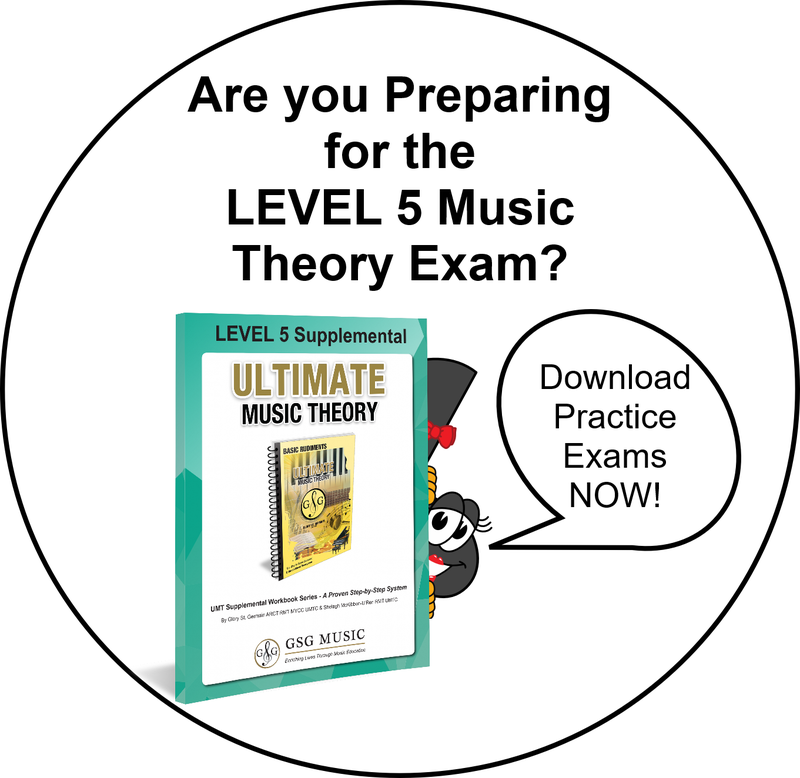 Level 5 Music Theory: How to Prepare for Successful Completion! 2 – The Supplemental LEVEL 5 Workbook. This Workbook is to be completed after the Basic and LEVEL 4 Workbooks. In this Workbook, students will learn all the new Harmony and History Concepts required for the Level 5 Theory Exam. There is also a BONUS Level 5 Theory Exam at the end of this Workbook. 3 – The Basic Rudiments Exam Series and the LEVEL 5 Supplemental Exams. Each Exam Workbook contains 4 comprehensive Theory Examinations that will thoroughly prepare students for the Theory Portion of their Examination. The LEVEL 5 Supplemental Exams (available for download with a Studio License for unlimited reproductions) provide 5 additional questions for each Exam in the Basic Rudiments Exam Series Set #1 and Set #2. This covers the new Harmony and History Concepts required by the RCM in their 2016 Theory Syllabus. There is also a BONUS Level 5 Theory Exam at the end of the LEVEL 5 Supplemental Exams. The matching Answer Books are available for both the Exam Series and the Supplemental Exams. 4 – To fully prepare your Students for their Level 5 Theory Exam, plan a MOCK EXAM in your studio. Print off the LEVEL 5 Practice Exam for each of your Students (your Digital Download allows you to print off UNLIMITED COPIES of this exam!). Provide your students with one hour to write this exam, and then mark their completed exams using your LEVEL 5 Theory Exam ANSWERS download. The RCM will change their Theory Syllabus Requirements every 7 years. It is very important to use ALL the Workbooks, Supplemental Workbooks, Exam Series and Supplemental Exam Series in order to prepare your Students for their Theory Exams based upon the 2016 Theory Syllabus. 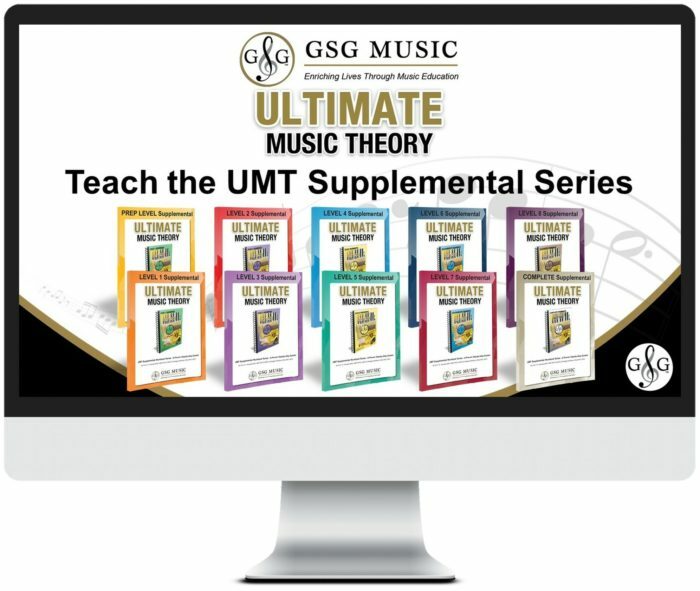 As a Teacher, if you do not have a strong foundation in advanced rudiments and harmony, it can take some time to get used to teaching these new Theory, Harmony and History Concepts, I would strongly recommend that each Teacher work through the Ultimate Music Theory Complete Workbook AND the COMPLETE Supplemental Workbook. Mark your own work using the matching Answer Books. You will feel confident and secure in your knowledge of these new Concepts! Teach the UMT Supplemental Series Course - 10 Video Sessions on how to simplify complex concepts from the 2016 RCM Theory Syllabus in the UMT Supplemental Series.